Are you afraid that your dog is going to run away or get hit by a car? If so, then it might be time to look into a wireless dog fence. 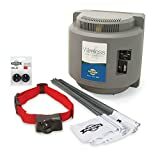 Are you looking for a way to keep your dog in your yard? You are probably dreading the idea of putting in the manual labor to put in a physical fence. Also, a fence can be somewhat of an eyesore on your property. You might want to consider getting some of the wireless dog fences that are currently available. There are a lot of different models out there depending on your budget and how involved you want to be in the process of setting up an electric dog fence. There are a lot of electric fences available. Typically, these fences require that you bury a wire around the boundary of your property. This serves as an indicator to the dog shock collar that your dog is exceeding your boundaries. When your dog crosses the wire, the collar will either beep, give a shock, or both. It really depends on how you set-up the system. You will want to set-up some flags along the boundary of your lawn so that your dog knows where the electric dog fence boundary is. A lot of people don’t want to go through the effort of burying a wire in their yard. If this is your concern, then you can get yourself a wireless dog fence. This involves setting up a controller in the center of your house or property. 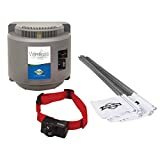 This will give your dog a circular perimeter, typically between 20 and 40 feet from the source of the controller. If you get one of these systems, you should grab a tape measure and measure the distance from the controller so that you know where the boundary of the dog fence is. You can then set-up some flags so that you and your dog can learn where those boundaries are. It’s important that when you get an electric or wireless dog fence that you take the time to train your dog where the border of the fence is on your property. That’s why it’s so important to put flags along the border. This gives your dog a visual queue of where the boundary is. When training your dog along the boundary, you should turn the shock level of the collar down to a low level. You want it to be at a level that just gets their attention. Make sure that you use the warning beep along with the shock. Typically, you can set-up these systems so that it gives a warning beep before a shock. While your dog is learning where the boundaries or your electric dog fence, you want to carefully watch them. You want to see whether or not they are able to leave the boundaries of your yard. You may have to make adjustments to the collar and the level of shock to get their attention and act as a deterrent. Some people feel that using an electric or wireless dog fence is inhumane to dogs. However, your dog is really smart and will learn the boundaries of your yard very quickly. It’s much better that your dog experiences a small shock than having your dog get hit by a car or causing trouble in your neighborhood.